I’m about to take my WO GT81 APO triplet on an extended trip where I’ll be doing outreach with it. I currently only plan to bring my 8-24 Baader Mark IV zoom and was thinking I might want to pick up a 2x Barlow vice bringing along my high power KK Orthos and have people struggle with the eye relief. Can someone recommend a decent quality Barlow? Would something like the GSO shorty Barlow fit the bill? I like that you can screw off the Barlow element & use it by itself for 1.5x as well. You can certainly get the GSO, but I have heard of at least one account where a user dropped the barlowing element after removing it from the main body, and onto concrete whereupon a lens or the lenses cracked. 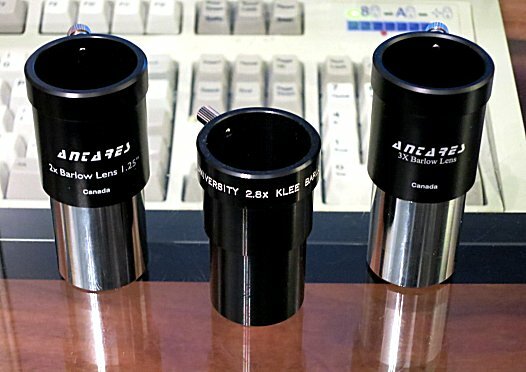 I had the Orion Shorty and compared it to the Meade 4000, and they are the same -just different printing on the barrel. They both had way too much internal reflections to suit me. I pulled mine apart and found the lens wasn't edge blackened and the interior of the body was black anodizing that was too reflective. I blackened the lens edges with a black Sharpie marker and gave the barrel a shot of ultra flat chalkboard spray paint. The difference was amazing. Then I purchased the ED GSO and that became my go-to Barlow no problems with it at all. I sold off the Shorty and don't regret it. I do really rate the Celestron X-Cel range for price/quality reflectivity. Wont break the bank but every piece i've bought seems to be of decent quality (seems good for outreach purposes). Mine is 1.25 not sure if you need the 2 inch though? If this is your first barlow, keep in mind that for the 2x multiplier with a 2x-barlow, the barlow must be inserted into the diagonal, and where the eyepiece is usually inserted, then the eyepiece into the barlow. If you insert the 2x-barlow into the visual-back of the refractor first, then the diagonal, then the eyepiece, you'll get at or near 3x instead. I have that Meade 2x barlow. I wanted a barlow that fit my diagonal to use with a Meade zoom. It's 'ok' for a $25 two element barlow, but I wish I would have spent a little more for a 3 element barlow. The one in the center is a 2.8x Heinz Klee, and a triplet. I was purchasing my eyepieces from University Optics of Michigan at the time, the business now defunct, and I wanted a barlow, and my first. I knew absolutely nothing about it, save that it was a barlow. Later, I found out that it is one of if not the best barlow for shorter Newtonians. Through same, in tandem with a 12mm Konig and my 6" f/5 Newtonian, the stars of the Trapezium appeared as players upon a stage, seemingly sentient, with the swirling nebula in the background as a cavernous and towering backdrop, and a sight I've yet to revisit, lest it disappoints. I am going to move this to eyepieces. Clearly, the OP is not a beginner asking beginner level questions and I think it will get better exposure there. One thing to be aware of is that the 2.5x GSO APO barlow is really a 2.1x barlow with non-TV eyepieces and a 2.0x barlow with TV eyepieces. It is a very good barlow optically. I keep it along with the 3x TV and the 1.6x Nikon 1.25" barlows. The biggest drawbacks to the 2.5x GSO are that (1) it is not threaded for filters and (2) it does require a fair amount of infocus. However, I have only ever had the 35mm Ultrascopic not reach focus with the 2.5x GSO in my refractors.